Featuring a wide variety of activities, Holiday World is a fun park which caters specifically to families on holiday in Gran Canaria. Kids of all ages can enjoy rides such as bumper cars, a Ferris-wheel, roller coasters and a pirate ship, as well as games such as ten-pin bowling and things like pony rides and a parrot show. There is a playground area for children too young to enjoy the rides. A range of restaurants and fast-food outlets are available and after dark there are some nighttime entertainment options, with frequent live shows and music concerts, an Irish pub and some other drinking and dancing venues. Adults who don't want to partake in the funfair attractions can luxuriate or sweat in the wellness centre, which offers gym facilities and spa treatments. On Tuesdays there is a craft fair at Holiday World, with stalls showcasing the local handicrafts and cuisine of Gran Canaria, as well as traditional dance, music and folklore performances, making this the best day of the week to visit. Address: Avda. Touroperador Tui, Maspalomas. Transport: Holiday World is easily reached by car, or else there is a bus service to Holiday World from each of the major towns and resort areas in Gran Canaria. Global bus lines 25, 30, 32, 36, 45, 52, 66 and 70. Opening times: The Funfair is open in autumn and winter from 5pm to 11pm, and open until midnight on weekends. 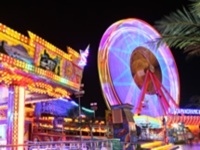 During spring and summer, the Funfair is open every day from 6pm to midnight. Admission: Prices start at €5 for 10 credits in the Funfair. Children's rides require three credits while other rides cost four or five credits each.